A dad has claimed a house building firm has put his family in danger. Colin Lauder and his family of three’s relocation to the plush David Wilson Homes in Montgomerie Park was supposed to be a dream move but quickly turned into a nightmare. A flood on their second floor and the resulting damage has seen the family go through hell since moving into their new house 19 months ago. Colin, 25, a construction worker, said: “I was fitting new flooring in the kitchen and lifted a skirting board to find a nail hammered through one of the water pipes – left from the construction of the house. 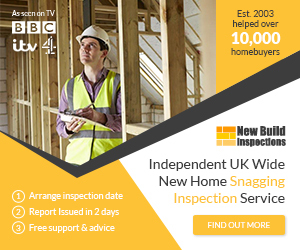 David Wilson Homes have since repaired the water damage to the walls but have refused to pay for a new television – despite asking Colin to fork out for a home damage report that cost him £40. Colin continued: “Since then they’ve left a kickboard uncovered – which has live electrical wires hanging out of it – and my one-year-old son could just pull them out and really hurt himself. “I had to move my son out of the house for three days after it all happened – it wasn’t fit for a child, it was too dangerous. “My heavily pregnant wife was rushed to the hospital last week – we thought we may have lost the baby – she was so stressed out and worried about the state of the house and the work taking ages to be completed. “Thankfully she’s okay now but it’s ridiculous to go through this with a house builder that’s meant to be held in such high regard like David Wilson. This week a spokeswoman for the David Wilson Homes customer service team said: “Customer satisfaction and quality control are absolutely key to our customer offer at David Wilson Homes. “In line with procedure, we have addressed Mr Lauder’s issues and have completed repair work to his new home. “We have also issued a full apology to Mr Lauder for the inconvenience caused to both him and his family. “When a leak occurred at the property, we took immediate action to repair the pipe and all damage to the floor has been corrected. “A new kickboard has been ordered and will be installed as a priority as soon as it is delivered. “In the meantime, we would be happy to fit a temporary cover should the customer wish us to.